This page contains foods, common household products and other everyday things humans come into contact with that can be toxic and even fatal to dogs and puppies. If you know of anything that you feel should be added to this page please contact us with your suggestion. Homemade playdough consists of flour, water and salt. Dogs may enjoy the salty taste, however it can cause salt toxicity, which can be fatal. When a large amount of salt is ingested, the sodium diffuses throughout the body. When the sodium reaches the brain and central nervous system, water builds up and tissues swell. As the brain swells, pressure builds up, resulting in severe neurological disorders. As the pressure builds, it causes seizures, coma and death. There is no antidote for salt toxicity. In some mild cases, where less salt is ingested, the dog may survive, however, if the dog eats enough, it is fatal. 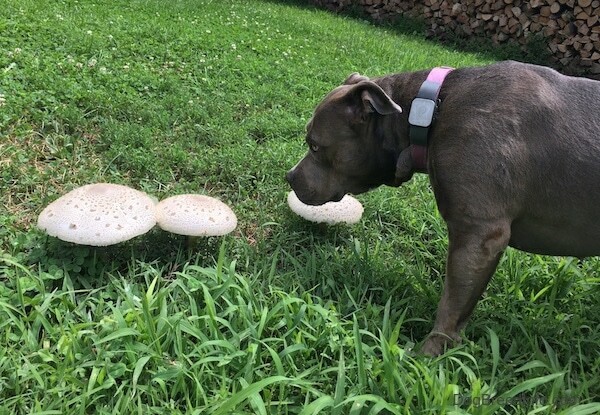 "Most dogs probably won't eat it but mine did and we had to put her down. Recipes for playdough contain a lot of salt, usually 1/2 cup, and I learned firsthand that this can be lethal. In our ignorance, we thought nothing of her eating the playdough, but her sodium levels were soon so high that she went into seizures and by the time we got her to the vet, our best option was to euthanize her, as she was suffering brain damage due to swelling of her brain." The seed from the black locust tree is poisonous to dogs and humans if ingested. The seeds come in pods that look like black banana pods. The seeds themselves are very hard, but look like oversized milk duds. They fall from the tree at certain times of year and that is when it is hazardous. The side effects may include vomiting and neurological effects which prevent the dog from being able to walk. Also loss of appetite. Antifreeze is perhaps the number-one hazard to a dog. Less than one tablespoon of anti-freeze could be lethal to a 20-pound dog. Antifreeze smells sweet and is very deadly. If the antidote isn't given within 24 hours, the dog is likely to die. When storing your antifreeze, keep it well out of reach. Check under your car from time to time to make sure it is not leaking on to the ground. Your dog will smell the sweet smell and may lick it up. You may want to use a new, less toxic antifreeze. It's still poisonous, but not as much as the traditional kind. For dogs, gardens and lawns offer a virtual smorgasbord of smells, and too often, tastes. More than a few plants, given a nibble or two, can turn your dog a little green. Most just cause an upset stomach, but some can be deadly. Make sure they are out of reach of your dog. Chocolate is another common canine hazard. Although it may be your favorite thing to eat, it can be very dangerous for your pet. Chocolate contains caffeine and a related stimulant called theobromine, which can make your dog seriously ill. Both of these stimulants can raise your dog’s heart rate, occasionally to the point of being fatal. Chocolate should be thought of as a poison to dogs. The effect it has on your dog depends both on its size and the amount of chocolate the dog consumed. The smaller the dog, the less chocolate it needs to eat in order to overdose. With baking chocolate, half to one ounce can cause death in small dogs such as Toy Poodles, Yorkies, Westies, and Chihuahuas. In medium sized dogs, such as Cocker Spaniels and Beagles, the amount is two or three ounces. In large dogs, such as the Golden Retriever and Dalmatian the amount is eight ounces. With milk chocolate, four to ten ounces can cause death in toy dogs, one to one and a half pounds in medium-sized dogs; and two to four and a half pounds in large dogs. A small amount may not cause death but it can make them very ill. Fortunately, most dogs that overdose on chocolate just get an upset stomach with perhaps vomiting and diarrhea. Sugar-free products which contain the ingredient Xylitol. Xylitol is a sugar alcohol which is sometimes used in sugar-free gum, candy, chewable vitamins, throat lozenges, pharmaceuticals and oral health products. We are discovering it is not very good for humans either, however it is even worse for dogs. In dogs the product quickly lowers blood sugar levels and can cause severe liver damage in a 24-hour period of time. Three grams of Xylitol can kill a 65-pound dog. That is about 8 to 12 sticks of gum in a medium to large breed dog and about 2 to 5 sticks in a smaller dog. Splintering bones such as fish, chicken, turkey and pork can be very hazardous to dogs. Fragments of the bones can get stuck in the dog's intestines and throat causing damage or even death. When a dog is given any type of real bone including a cow leg, supervision is always recommended as pieces of the bone can splinter off. Be sure to take away any small pieces so they are not swallowed. Around the holidays you need to be especially careful. Mistletoe is extremely poisonous. Tinsel can be dangerous for your dog if he decides to eat it. You have to watch those thin glass Christmas balls too. Also beware of Styrofoam. Styrofoam will not digest and may get stuck in the intestines. Visit our Holiday First Aid page. Dogs can also be poisoned by Advil®, Motrin® (Ibuprofen) and Tylenol® (Acetaminophen). Aspirin cannot be given on a long-term basis because of its blood thinning properties. Do not give your dog human painkillers without consulting your veterinarian first. List of foods which can be toxic to dogs. Some of the foods can actually be good for humans. These foods should be avoided and not fed to dogs. If you know of more foods that should be added to this list please contact us. With a growing interest in home brewing beer it needs to be more known that hops are extremely toxic to dogs. We composed our hops and lost our beautiful chocolate Lab when she dug into the bin to get to the sweet-smelling hops.